While we wait the technology to progress enough for realtime global illumination to be possible, we have to find hacks if we want to create believable images. Over the years, a countless amount of hacks have been developed, from high quality precomputed light probes encoded in spherical harmonics and stored in volumetric data structures (like octrees or tetrahedra grids) or plain textures, to dynamic approximations with raymarching in low resolution volumes, or mini-rasterization of pointclouds, to screen space hacks like screen space ambient occlusion (SSAO) and color bleeding (SSCB). 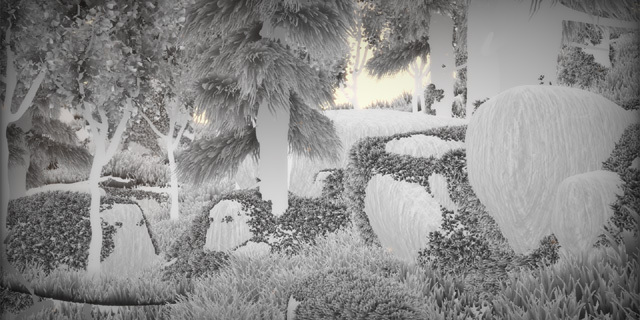 From all, the most popular technique among the hobbyists has been the SSAO, for it doesn't need the tedious development of baking tools at all, but a simple pixel shaders with a handful of lines of code. In my opinion, it's also the most abused and probably wrongly applied effect (closely followed by bloom), but more of that later. Besides halos and performance, the main issue that limits the usability of SSAO is the range of distances at which the technique produces results that can be interpreted as occlusion. Indeed, high neighbor sampling kernels not only are expensive but actually do not represent occlusion very well, due to the lack of second and third depth layers to sample from. At the same time if the kernel is made too small the illusion of occlusion disappears as well, and all that remains is an ugly edge enhancer which gives it all a horrible cartoon shading effect. So, it seems that traditional SSAO is optimal only to solve medium frequency occlusion, while big/small size occlusion (low/high frequencies) need something else. 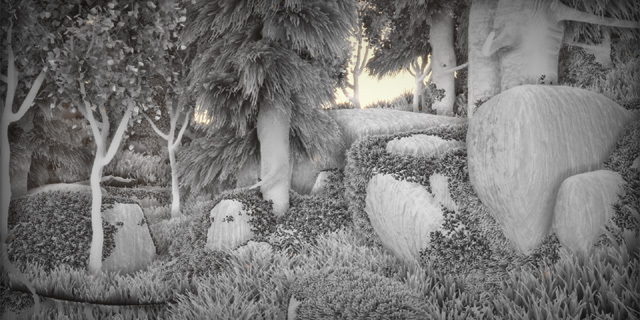 In this article we'll see one approach to solve the three types of occlusion for one specific type of scene, although the ideas can be (and probably has been) in other contexts. High frequency occlusion, in this scene I'm dealing with and in many others, can be regarded as the occlusion an object casts on itself. That means that the occlusion signal can probably come from the model itself, either in form of backed information or with a procedural description. In case of nature, a procedural description for occlusion makes a lot of sense. 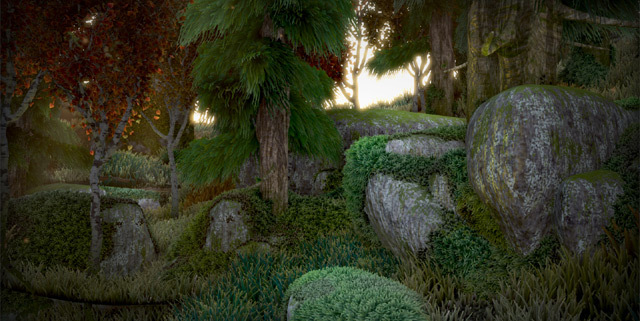 The same procedural methods that grow the grass, bushes, tree trunks and branches or canopies can take care of producing an occlusion signal too that matches the procedurally generated geometry. In other words, since the code/procedure generates the geometry, it knows about it (like, where it is, how big it is), therefore it can produce plausible occlusion information. For example, when generating leaves for a tree canopy, those in the inner part of the canopy can get darker than those outside (this is a very simplistic approach, but it shows the concept). The code that procedurally grows the grass can shader blades darker or brighter depending their relative position to the clump they belong to. 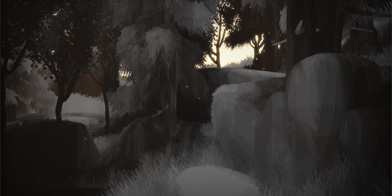 The trunk of a procedural tree can get darker in the areas where the amount of branches is higher, etc etc. These might seem like naive observations and way to do high frequency occlusion, but in practice it works very well. If for some esoteric reason you were looking for something more "physically realistic", you could bake the local high frequency occlusion of your models per vertex or in a lightmap. The idea of course is to not bake all the occlusion we can procedurally. Sometimes it's tempting to be too clever and generate procedurally or bake as much occlusion as possible, but we don't want to do that, for the point is to make occlusion realtime and as automatic as possible as part of the lighting solution. So, we want to generate/bake only the occlusion that the medium frequency realtime ambient occlusion (SSAO in our case) cannot capture. Now that we have a beautiful occlusion signal, it's time to use it in our lighting pass. One mistake most beginners do is to use the occlusion as a multiplier to the whole lighting equation. That's is NOT A GOOD IDEA, and among other issues, it produces horrible ghosting effect that have become sadly regular in most realtime rendering efforts. Now, even if you had perfect halo free ambient occlusion, multiplying the whole lighting equation with it would still be A REALLY BAD IDEA. 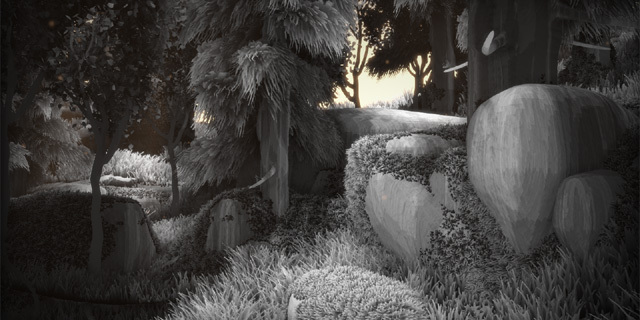 Ambient occlusion is, after all, an occlusion factor for the ambient lighting. "Ambient" is a bit of a vague term, but in the context of classic OpenGL-kind of rendering, it probably means all lights but the key lights, meaning the sky dome lighting, all of the bounce lighting, and the rims. In practice, it means that you probably only want your occlusion signal to affect all the lights witch are not strong direct lighting sources. In our case, the occlusion will affect everything but the sun light. It's all up to you to choose how much occlusion you leak in each light, and there are many ways to do this. You can even colorize the occlusion signal with a color ramp to bring some extra richness to the image. If you allow me, here goes another advice: do not implement the infamous "hemispherical occlusion", the trick of modulating occlusion with the vertical component of the surface's normal. That's probably a really bad idea because, again, we want to use occlusion as little as we possible can (remember it's an ugly hack). Instead we want to use real lighting equations and framework. So, in order to do proper sky-dome kind of lighting, put a blue directional light coming from up in the sky pointing downwards (which produces a blue version of the otherwise gray-dead hemispherical occlusion trick), and give it some color variation based on the incident angle. That looks a million times better than the horrible hemispherical occlusion, and it is equally cheap. Anyway, this is not a lighting tutorial. So, back to the multiresolution occlusion, when you apply it to the ambient lighting, you quickly get results that look acceptable for the little amount of work and embarrassingly simple algorithms/ideas that we have been using. 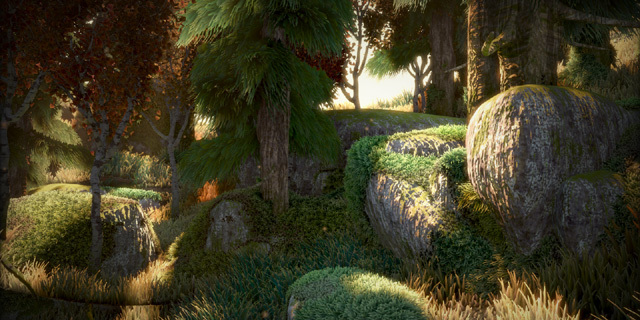 Here you can see the scene rendered with only ambient light using the multiresolution occlusion described in this article, and the same image with the sun light added.